Strawberry plants in bloom. On frosty nights, we irrigate to protect the plants and blossoms, using the irrigation pipe at left. That’s our strawberry field in full bloom. We tend a new strawberry field for a full year before the first harvest, so it’s exciting to see the plants survive the winter in good shape. We lost the entire strawberry crop last year. The plants broke dormancy too soon because of early warm weather, and the blossoms were killed by frost despite our efforts to protect them. Let’s keep our fingers crossed for this year. Strawberry leaves covered in ice after we irrigated early Friday morning to protect from frost. As water crystallizes into ice, it releases heat which keeps the plants safely at 32o F.
The irrigation worked and the blossoms were not damaged. At center is a flower whose petals have dropped. You can see the developing green strawberry. I will deposit June 1 checks on June 4. Many of you paid with checks post-dated to June 1. Remember? I will deposit them on Tuesday June 4 so everyone has enough time to adjust their account balances. If you are uncertain of your check dates, you can send yourself a receipt that lists your payments by date. We have 17 shares still for sale. There’s room at all sites except Atwood, Buckeye and the Outpost in Wauwatosa. We would especially like to find new members for our site at the Outpost on Kinnickinnic Ave. in Milwaukee. Tell your friends. We’re eager to settle the membership and focus on farming. Thank you. Bonnie trims rhubarb stalks. Note the slew of trimmed leaves in the row behind her. 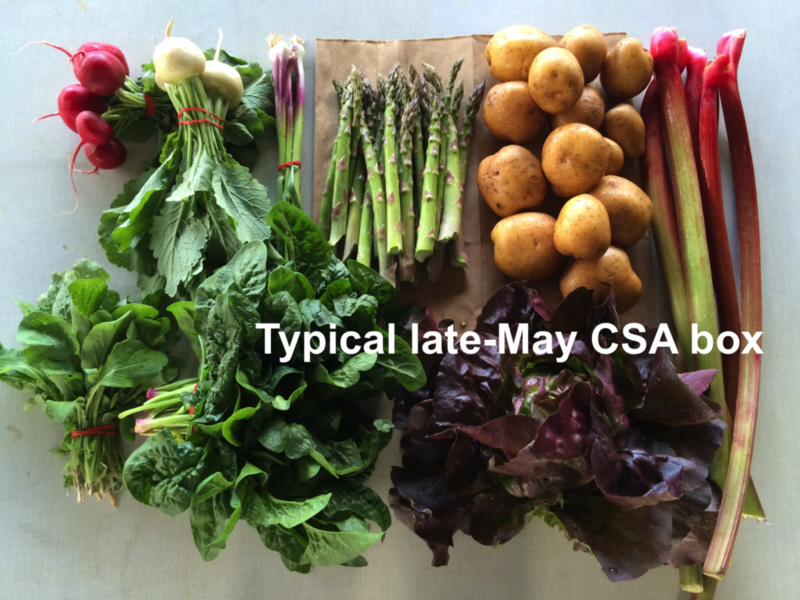 Our field consists of 12 rows but we only needed three rows to fill the CSA boxes last week. Wow. Veggie Notes. The big story this week is rhubarb. We divide and refresh our rhubarb plantings every five to eight years to keep the plants growing strongly. Rhubarb stalks get thinner and thinner as the crowns become crowded. Early this spring, Steve mused that might be a problem this year. Ha! This is the most vigorous rhubarb growth we’ve ever seen. We had to cut the stalks in half so they will fit in the CSA boxes. We plan to send rhubarb again next week because of the bounty. Asparagus – See last week’s newsletter for info on storage and preparation. Rhubarb – FYI, rhubarb freezes beautifully. Chop into chunks and freeze in a bag. No need to blanch. You can also freeze rhubarb sauce. See last week’s newsletter for more info about rhubarb. – Parsnip fries are delicious: cut like French fries, coat very lightly with oil, place on a cookie sheet and roast in a hot oven until cooked through and browned. Farm cook Lacey made those for us this week. – We often pan-fry onions with onions and garlic. Button mushrooms – These organic mushrooms are from the folks at Hidden Valley Mushrooms in the Wisconsin Dells. We often buy mushrooms from them for our spring boxes. They enliven spring salads when our crop list is short. Mustard greens (small bundle of flat green leaves) – These are “salad quality” mustard greens, so young and tender that you can use them raw in salads. They are excellent cooked until wilted, but will shrink considerably. Lettuce – The lettuce is still very young and tender. Handle carefully.